The banana ‘ooman dem’ and ‘gyal’ is a black and white temporary graphic application set on the walls of the Abbey Court apartments, facing Trafalgar road. On my way from the Saint International's “Fashion Block” I spied 3 suspect characters getting the activation ready at 4am, and at the break of dawn, voila; a back bending, head turning traffic blocking spectacle courtesy of Leasho Johnson. 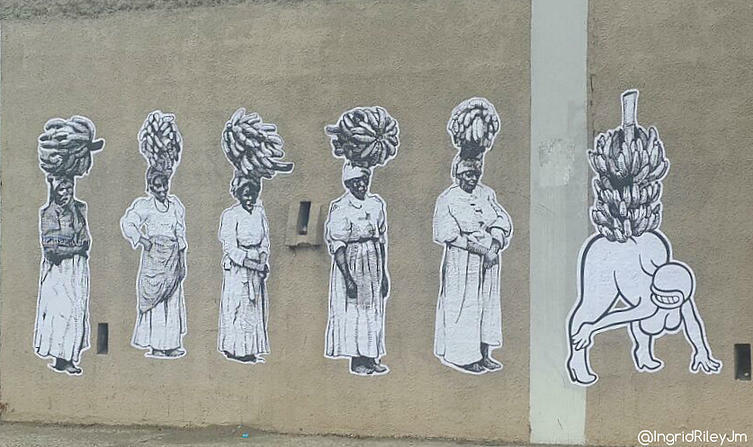 View more creative work from Leasho and more on the Jamaica Art For Commerce Council page and expect and enjoy more out of the wild installations from our young Banksy.